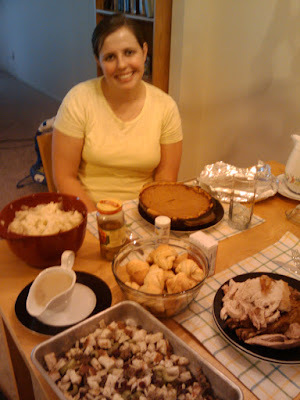 This year was our first Thanksgiving ever on our own. For the past three years we have spent our Thanksgivings sleeping late, going to Mom and Dad Knight's house just in time to eat, and then napping on their couches all afternoon with breaks only for seconds and thirds on pie. Before that, all of the Thanksgivings I can remember were at my grandparents' house. There were always so many aunts, uncles, and parents around that everyone in my generation was kept out of the kitchen until the meal was ready. Todd gets really excited about Thanksgiving. 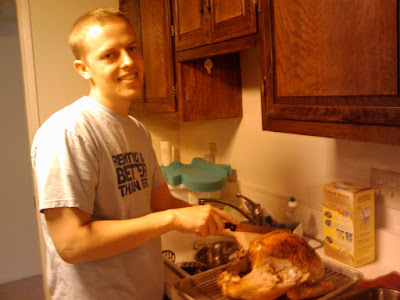 His relationship with turkey, stuffing, mashed potatoes, and gravy is almost romantic. I decided that since he works so hard, he should not be deprived of everything he loves about Thanksgiving just because we can't drive 15 minutes to his parents' house in the middle of the day. Having never even seen a Thanksgiving dinner prepared, I knew this meal was going to be a project. When I was preparing the turkey, I got it all dressed and ready to go in the oven, only to discover that my roasting pan was too big for my smaller than average oven. I had to make a quick switch, but the turkey made it. 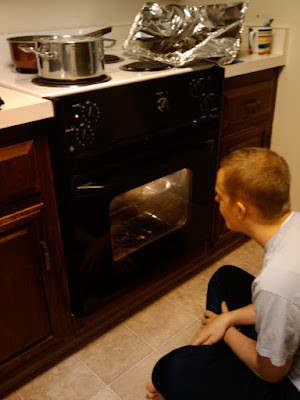 The only other mishap, not counting the pumpkin pie filling spilled all over the inside of my oven, was with gravy. I worked on it for half an hour and could not get it to thicken. I was on the verge of giving up and making the instant gravy that I bought just in case, when the gravy miraculously thickened to the perfect consistency! Too bad I have no idea how I made it work. Two burns and two finger slices later, we had a beautiful turkey, stuffing, mashed potatoes, gravy, croissants, and pumpkin pie. Todd had his Thanksgiving! It wasn't perfect, though. We missed the festive atmosphere our extended family brings to the holiday. Todd spent Thanksgiving day coughing, sneezing, and pretending not to be miserable so that I would let him help watch Jared while I cooked. He would make any sacrifice necessary to get his turkey! 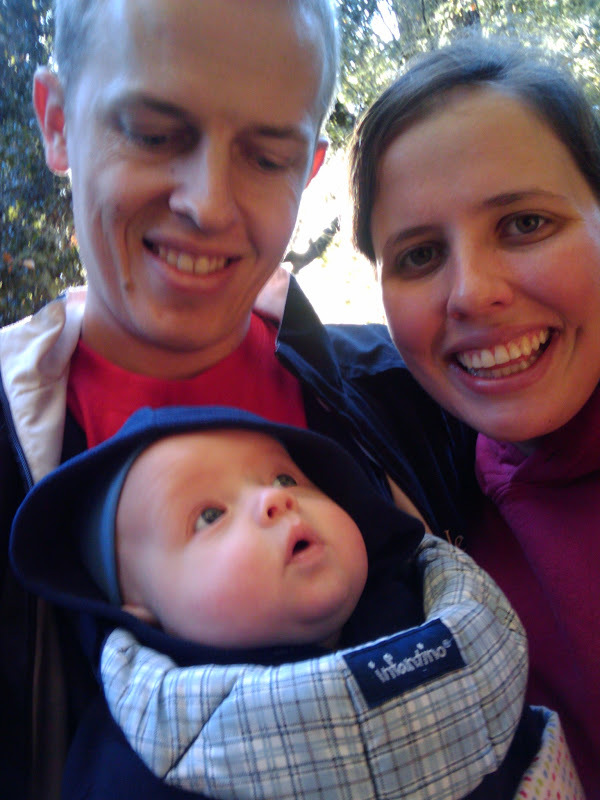 After a sleepless Thanksgiving night, we took him to the doctor's office where he was diagnosed with a mild case of pneumonia. While it hasn't managed to ruin our holiday, being sick does take a lot of the fun out of it. Jared enjoyed his Thanksgiving feast like any other meal. 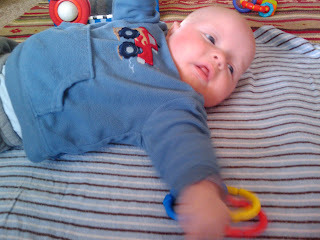 He is happy to coo and babble until his daddy sneezes or blows his nose, which makes him jump about a foot every time. The great news for us is that on this side of Thanksgiving we can start to get really excited for our Christmas holiday. We will see all of you missed family and friends in less than a month! That is something to be thankful for. As soon as Jared turned three months old, we decided that it was high time for him to be introduced to more of his parents' favorite pastimes. He has been picnicking with us since he was only a few days old, and he is on the computer with Daddy every time Mommy looks away (no screen time until he is two! ), so we decided to take him hiking. We were on our way to Portola Redwoods State Park (which we discovered with Annika and Ryan last July) when we discovered Purisima Creek Redwoods Regional Open Space. The open space preserve didn't have as many redwoods, but it is much closer to home, has gorgeous views, great trails, picnic tables, and, one of our favorite features of anything we can find in the expensive bay area, it's free! Parking was a hassle, but we're getting pretty used to that anywhere we go around here. On the drive there we found several places where we could see the ocean and the bay at the same time. What a cool place to live! Jared loved hiking. He is a very curious boy, so the new environment gave him a lot of stimulation. It was a cold November day in the mountains, but he didn't seem to notice that at all. He couldn't get enough of the trees arching over the trail. We hiked for over an hour, and he spent most of the time looking up at the little patches of sky above our heads. It's too bad that the weather is getting colder. Now that Jared is a hiker, we are excited to go again as soon as we can. Jared's next new activity will have to be camping. Todd can't wait to show the little mountain man how to play with fire. I wish I could capture everything wonderful about being a mommy in one picture. I want to always be able to remember the excitement I feel at each of his new accomplishments, the gratification of having calmed him, the way his little bit of hair fluffs up like a downy chick after his bath, and even the perfect little frown he makes to warn us that he is about to cry. Jared turns three months old today, and already I can feel those precious moments spent cuddling my tiny newborn boy slipping away. Every day he is a little more independent. I can't imagine any experience that could challenge and gratify me as much as being a parent. I hope, as Jared gets older, I never forget those sweet faces he makes while he eats, or that he once struggled to get his little fist into his mouth or to pick up his head. I am content to sit back and watch him all day because I can't imagine anything I could love more than every expression of his face. This is the hardest thing I've ever done, but I couldn't be happier. 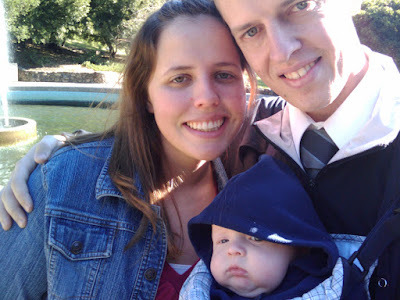 Yesterday we went to Oakland for a picnic and a trip to the temple. Just up the road from the temple is Joaquin Miller Park, which we discovered a couple of months ago at the recommendation of one of the senior missionaries in the temple visitor's center. In the past we have just thrown down our picnic blanket to eat and run, but this time we decided to explore the park a bit. Here is Todd with Jared next to one of many fountains in the park. 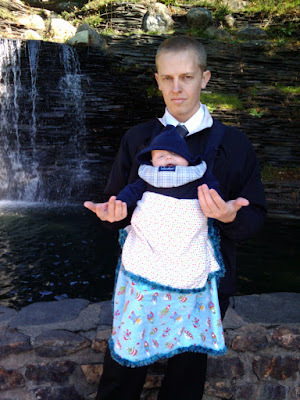 It was a chilly day, so Todd wore this blanket (made by our friend Dru) as an apron to keep Jared's feet warm. Jared blows bubbles when he is hungry. 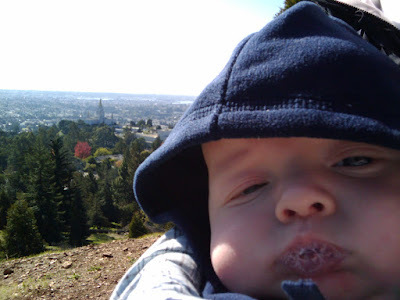 You can see the Oakland temple behind him, and the bay in the distance. We didn't get to see much of the park because Jared was starting to get hungry, and we ended up leaving the park in a hurry for one of those very unglamorous parenting events that culminates in washing out your child's clothes in the sink of a public restroom. However, our temple trip/picnic is a monthly event, so we will have many chances to see more of the park. It has great views of the San Francisco Bay. We have exciting news. Jared has started to sleep through the night! 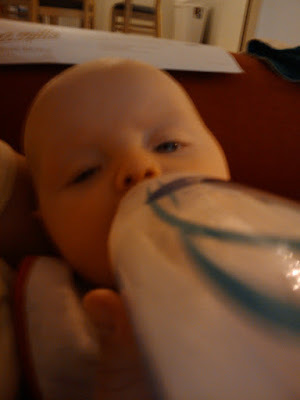 Since he is three months old, the experts say that he is old enough to go 8-9 hours without needing to eat. When he woke up for his 2:30 a.m. feeding on Thursday night, I rocked him back to sleep without feeding him. 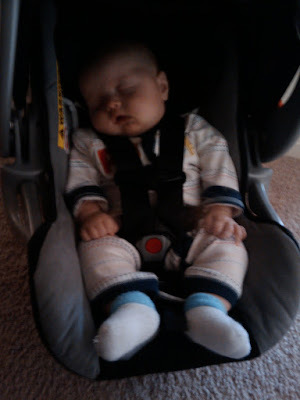 Since then he has slept from 8:30 p.m. to 6:00 a.m. without a single waking! This is big news for us since we haven't slept through the night in three months. What a good baby. We are starting to get excited for the holidays. We just bought our plane tickets for our trip to Utah and Arizona to see our families and friends who we have missed since we moved. We can't wait to see you! 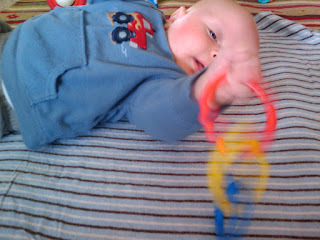 As Jared gets close to his three month mark, he's reaching some important milestones. Last Wednesday (Todd's birthday) I put him on his tummy on a blanket while I cleaned the bathroom. When I came to check on him, he was picking up his head! He had picked up his head before, but never very far or for very long. Now he is picking it waaaay up, and doing it all the time! This means that he has entered what the other mommies in our play group call "the turtle phase" because he looks like a turtle peeking out from his shell. Here is a picture from last week. . . . . . and one from today. Jared has also entered the difficult world of toys. 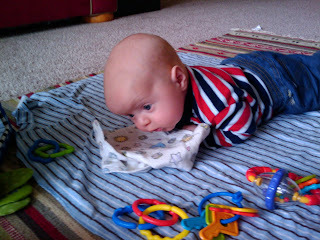 We've been putting toys on his blanket for him for a while, but he just looked at them, or watched us play with them. Yesterday he started reaching for them. 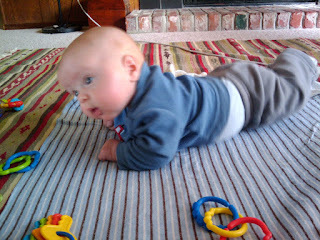 His coordination is really bad, so far. He will reach for a toy, and when he can't grab it, he gets frustrated. 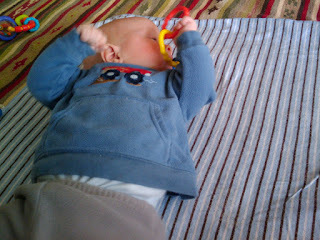 When he does manage to grab it, he tries to put it in his mouth (because what good is a toy that you can't taste?). When he can't get it in his mouth, he gets frustrated. 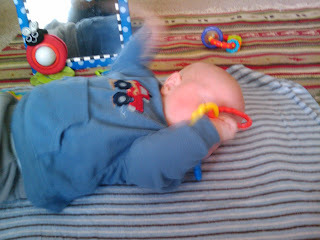 If he does manage to get the toy into his mouth, he will immediately yank his hand away without realizing that he is still holding the toy, which makes him mad. 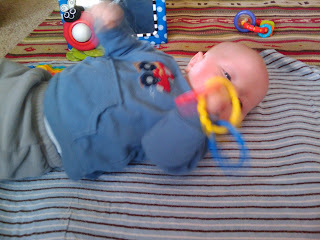 It's hard to take a picture of him with his toys because, of course, this effort requires that he wiggle his whole body from the moment he spots the toy to the moment he drops it. You can see from the look on his face how hard he is concentrating. Both arms are flailing and both legs are kicking through the whole process. It's hard to watch him struggle so much without intervening, but it pays off. After an hour of this at a time he is napping better than he has in weeks. Who knew playing could be so hard? I know this is a little late, but this is our Halloween post. 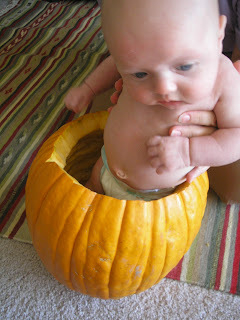 I thought it would be cute to put Jared in a pumpkin. He did not think it would be cute. 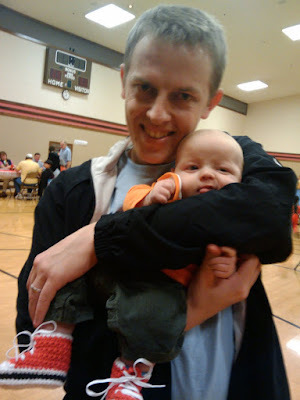 Most of our pictures did not turn out due to his squirming, but it's hard for Jared not to be cute, even when he's mad. Look how huge his cheeks have gotten! We decided to try something new and roast our pumpkin seeds. It was super easy and they were really delicious. We especially liked the ones we roasted with garlic and salt. We aren't normally big fans of Halloween, but Todd wishes that pumpkin carving happened more often so we could roast more seeds. I wish I could get Todd so excited about cooking more often. 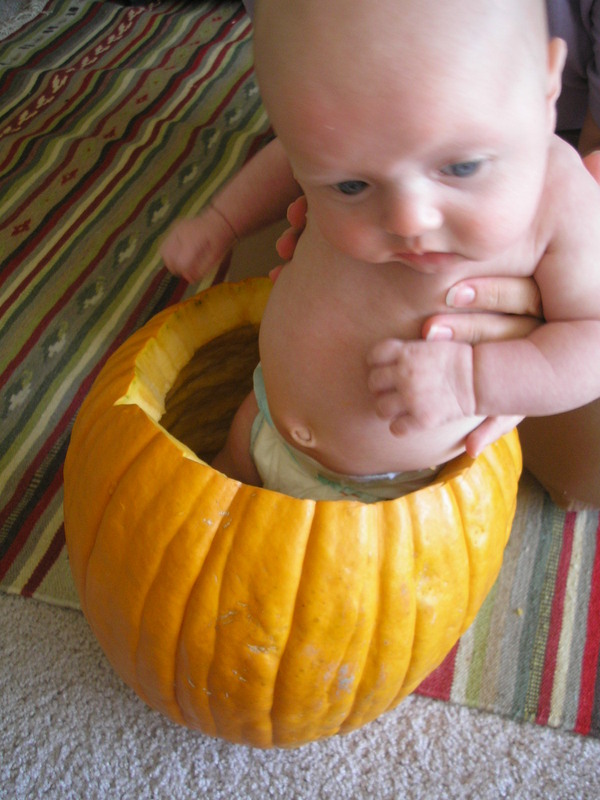 And here we are: The proud mama and papa of one very handsome jack o'lantern; our first together. It was named, very creatively, Jack. Also the proud parents of one very handsome li'l punkin.